Plus, you could WIN your own copy for your little one to enjoy! 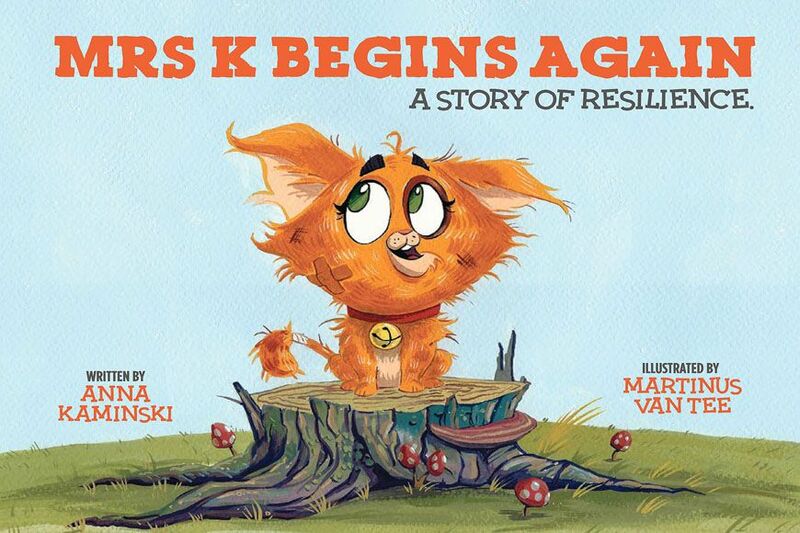 Written by Anna Kaminski with illustrations by Martinus Vantee, Mrs K Begins Again redefines resilience, giving it a whole new meaning for readers both young and adolescent. The story tells the tale of a cat named Mrs K, who happens to stumble upon trouble wherever she steps, something which Kaminski narrates in a humorous, kid-friendly way. Even as early as the first few pages, the reader is treated to an educational writing style that is rich in terms, featuring words like domestic, impressive, exotic, soaked, and drenched. Along with pet-specific verbs such as: licked, meowed, scratched, stung, and strolling. Reading through Mrs K’s adventures (and mishaps), we couldn’t help but notice the underpinning of moral values which Kaminski embeds into the cat’s journey; this becomes clear when the cat faces challenges with patience and determination. This moral underpinning forms a pattern: after every challenge Mrs K faces, she does the same thing. The adventures of Mrs K argue that being unlucky once in a blue can also mean a chance to start over the next morning, and that this is what makes people extraordinary like Mrs K.
“A Story of Resilience” refers to the power of “moving on,” as it marks overwhelm and disappointment as bends rather than breaks. The book also provides a guideline-like directory to taking care of pets; implied in the approach taken in caring for Mrs K “the cat.” As it points out the particulars in cats’ nutrition – milk and fish crackers – and their aversion to water. The illustrated drawings featured in the book also caught our attention, as they were colorful, cute, and rich in meaningful elements. The book also presents a guide to Mrs K’s breathing exercise for the little ones to follow when frustrated, sad, or upset. We loved both Mrs K and the book. if interested about this adorable cat, enter this competition for a chance of winning your own copy of "Mrs K Begins Again: A Stroy of Resilience." Make sure you enter before the 30th of coming October, and who knows, you might be the lucky one!